Giveaways for 2012 are finished! 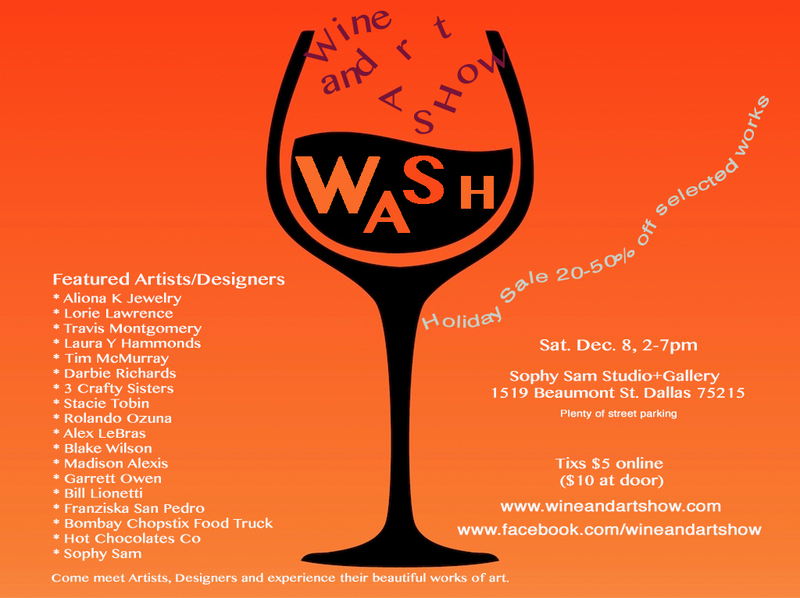 I want to thank all our Giveaway Sponsors for sharing their amazing products with the DFW Craft Shows Community. Once we have hit 2013, and I have had a chance to regain my footing, the giveaways will start back up again. I'm excited to share a new year of fun new products with you. Existent Event Listing Upgrades and Ad Space will be served as promised! New orders may experience a slight delay if we are in the baby zone. New events will continued to be listed as quickly as I can parse through them. I will also be responding to email as quickly as I can. What I am trying to say is: I'm not wandering too far from the home base here, but I do appreciate your patience and understanding if my responses are a little slower than usual. If you have any concerns that you would like to discuss, you can always reach me at dfwcraftshows@gmail.com. Well folks, that's it for now! Wish us luck! Until next time: Shop. Sell. Local. 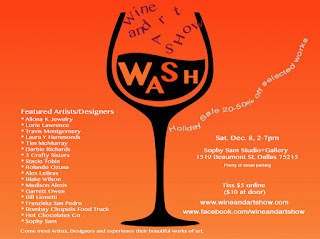 Please check out The Tour for loads of information on how to parse through all the information on DFW Craft Shows.com. I have tried to build in as many tools as I can to make your lives easier--after-all, that is what the site is all about. Applications are available here and are due by May 5th, 2013. "The Duke and Oliver Foundation is hosting a vendor fair and would love for you to participate! This will be a great opportunity to promote your business, sell products/services, and get new customers all while supporting a great cause! There will be lots of advertising for this event including radio time on 103.7! The Duke and Oliver Foundation is a nonprofit that supports dog rescue groups with emergencies, medical expenses, training and support." Booths are 10 X 10 and cost $100 for the weekend. You can purchase one day for $75. They are asking that you donate a product or service, value $50+, with your booth fee. Applications are available here and are due by December 1st, 2012. For more information, contact their event coordinators at katie@threedogtexas.com / christyhillhoward@gmail.com. Booths are 6' tables and cost $50. This includes tables, chairs, and breakfast for vendors. To apply, please email ippunamcwilliams@rocketmail.com by December 8th, 2012. For more information, contact their event coordinator at ippunamcwilliams@rocketmail.com/ threeredpeppers@ymail.com. 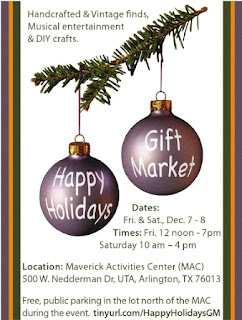 "This weekend we will be open for a very special 4-day event where you'll be able to find unique, locally handmade gifts and holiday decor. Santa Claus will be available for photo opportunities and a caroling choir will sing holiday tunes." 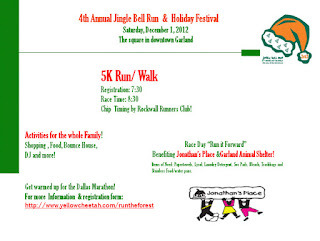 "NFHS 2013 Booster Club is hosting our 4th Annual Jingle Bell Run & Festival in collaboration with the City of Garland! We will have vendor booths for shopping set up in the square, a DJ and bounce house in the kids area! This year we are benefiting 'Jonathan's Place' and 'Garland Animal Shelter' donations of items of need will be accepted!" "Mark your calendar and come shop with us… We have 34 vendors to shop from! No Mall Crowd and Reasonable Prices!" I-35W South and Alta Mesa Blvd. 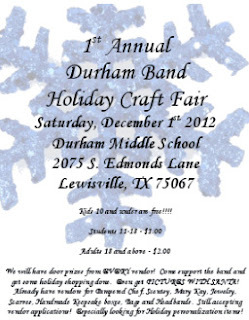 "Join us for our first annual craft show! 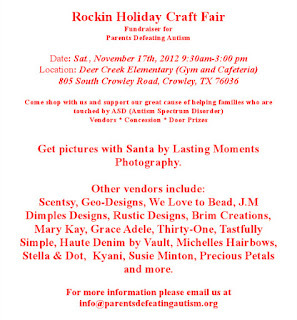 We will have numerous vendors as well as snacks and maybe even some pictures with Santa!" "He’s making his list and checking it twice going to find out who’s naughty or nice! Santa Claus is coming to Poynter Elementary School! 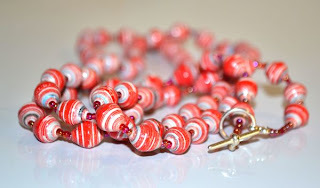 We will have handmade crafters and direct sales. Like Vault Denim, Pampered Chef, Scentsy, Velata, Grace Adele, Mary Kay, Thirty-One, Paparazzi Accessories, Diva Duck Soaps and so much more. Bring your child’s letter to Santa! This is a Fundraiser for Poynter Elementary PTA! 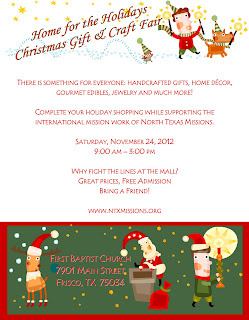 Save the date and get your Christmas shopping over early!" Admission is free, but they will be collecting can goods for the local food bank. St. Monica's PTO Christmas Market - "Stocking Stuffers and Spirits"
"Stocking Stuffers & Spirits is a unique Christmas Market. An evening filled with fun and shopping with a variety of vendors, gifts, and holiday items to help you complete Santa's list! 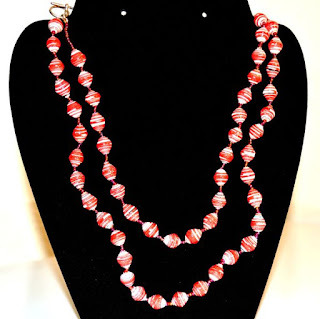 *Unique Gifts * Jewelry * Custom Clothing & Footwear *Home Accessories * Specialty Foods * Stationery... and much more!" Applications are available here and are due by February 9th, 2013. 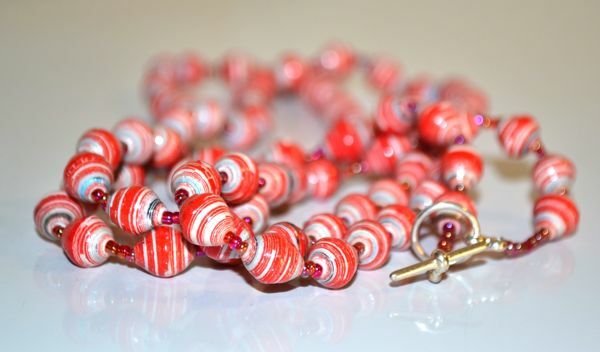 "Lots of craft product vendors to choose from. Free admission!" Booths are 6 X 6 and cost $25. This fee includes table and 2 chairs. Electricity is an additional $10. For more information, contact their event coordinator at BonnieBridgewater3@yahoo.com. Booths are 6 X 5, cost $50, and include 2 chairs. Electricity is an additional $5.00 fee and must be indicated on application. Applications are available here and are due by December 12th, 2012. Please contact event coordinator below before sending payment. For more information, contact their event coordinator, Becky, at sischap@sbcglobal.net / 214-794-2726. "Mark your calendars for Saturday, December 1st. Santa will be arriving by helicopter at 10AM and will be there until 10:45 AM. There will be lots of dogs and cats looking for a forever home. Come and join the fun with the family and give a pet a home! Other attractions include: Bounce house, local vendors, low cost vaccinations (10 AM to 12 PM), food & fun, local rescue groups and much more. Come and join the fun!!" Booths are approx. 10 X 10 (larger booths can be accommodated, if requested) and are available for either event sponsorship (levels are $100, $150 or $250) OR by donating 5% of your gross sales to the Paw Prints Animal Rescue group. Applications are available here and are due by November 29th, 2012. For more information, visit their website or contact their event coordinator, Charla, at cmasarik@hotmail.com / 469-834-7394. Booths are a 4 - 6 ft table depending on need and cost $35. Electricity is included, bring your own cord. To apply, send a description and pictures or link to online store to panthercitybarbazaar@gmail.com by November 26th, 2012. Acceptance letters will be sent out along with an invoice for booth fee. 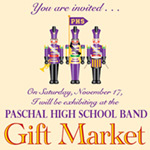 "Liberty High School Redhawk Band is hosting REDHAWK MARKETPLACE. This market features the taste and talents of local merchants that offer holiday and home décor, gifts, jewelry, crafts and food." Tables and electricity are available for additional fees. Applications are available here and are due by November 23rd 28th, 2012. For more information, contact their event coordinator at becky.potter@vertexgroup.com / 214-206-6701. 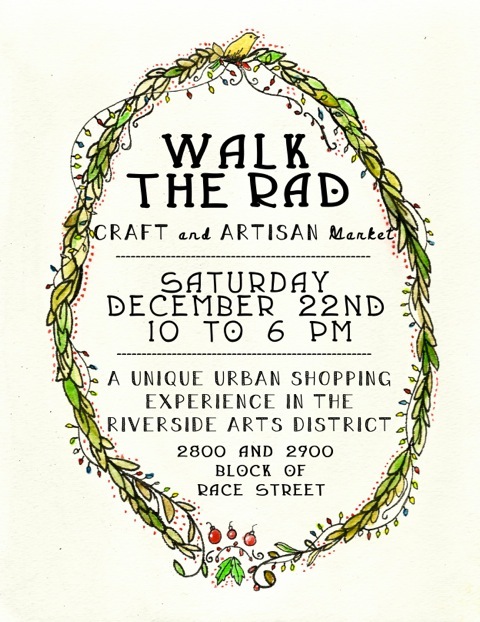 "Come stroll under the twinkle lights and shop with some of the most unique and creative handmade artisans in the area. There are lots of vintage goodies too! The farmhouse will be decorated in all her Christmas fineness. The city of Anna will be hosting their annual Christmas parade and Pictures with Santa event on Saturday. Free admission and parking, but we'd love it if you brought some non-perishables for the Anna Food Pantry!" Early Vendor Discount - $10 off prices above through November 20th 25th. These fees include bottled water and homemade snacks. They have 8 ft heavy duty tables available for $10. Applications are available here and are due by November 20th 25th, 2012 to take advantage of the early registration discount. For more information, visit their website or contact their event coordinator, Lisa, at girlmakesgoods@gmail.com / 972.839.4225. Booths are 15 X 20 and cost $25 / day. To apply for this event, please email the event coordinator at kara.thevault@gmail.com ASAP. For more information, contact their event coordinator at kara.thevault@gmail.com / 972-880-9360. 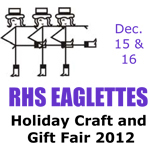 "The Craft show has everything imaginable for your early Christmas shopping. We have all types of businesses and handmade crafts." Booths are 10 X 10, outside, and cost $25.00. Vendors are requested to donate something for the door prizes. Electricity is NOT available. They will have high school clubs assisting the crafters with moving in and out. Applications are available here and are due by November 20th, 2012. You will not have a confirmed spot until they have received both application and payment. For more information, contact their event coordinator Sharry Jones at blingznthingz01@ymail.com / 817-565-2980. "WOOF-Stock 2013 is gearing up to be the Pet event of the year. Hosted by Kuykendall Insurance, it is an annual fundraiser to raise much needed funds for the local animal shelter and animal welfare awareness. With great sponsors and affiliates this year like Progressive, MetLife, The Hartford, Travelers and more, you won't want to miss the opportunity to be involved. Vendors, Food, Live Music, Games, Contests, Pets and FUN! Bring your pets and get your Hippie on!" These fees include a listing on their website and Facebook pages. No electricity provided. Applications are available here and are due by January 10th, 2013. For more information, visit their website or contact their event coordinator at melanie@woofstocktexas.org / don@woofstocktexas.org. "Finally a place where Trendsetters gather to Mix, Mingle and exchange Industry ideas...Weekly Hair Salon, Fashion Boutiques, Photographers & Makeup Artist Spotlights..."
Booths are $50. Vendors need to provide their own business cards, brochures, 6ft table, table cloth, and products to display and sell. For more information, visit their website or contact their event coordinator at Mix_MingleBusiness@yahoo.com / Chastity 214-620-5708 / Fax 972-442-1786. "Pre-Black Friday Open House! Come and enjoy a relaxed shopping experience before the hustle and bustle of the holidays! 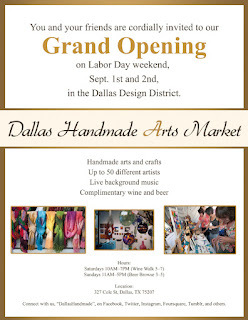 Enjoy complimentary entry, refreshments, childcare, and ease to shop local vendor's items and services! There will be photographers, cosmetics, heath/fitness, home remodeling, furniture, jewelry, scentsy, restaurants and much more! 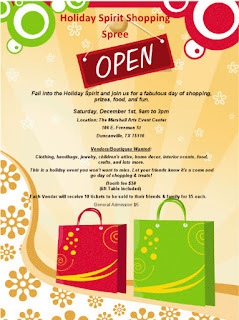 Come enjoy the fun and get a head start on your shopping!" Booths are 10 FT spaces and are FREE. There are only 5 left. Vendor must provide their own table and extension cord, if needed. There will be free childcare and refreshments. SPOTS ARE FILLED. Applications are available here and are due by Friday Nov. 16, 2012. For more information, contact their event coordinator, Brittany, at brittanyfaith@msn.com / 682-557-9043. 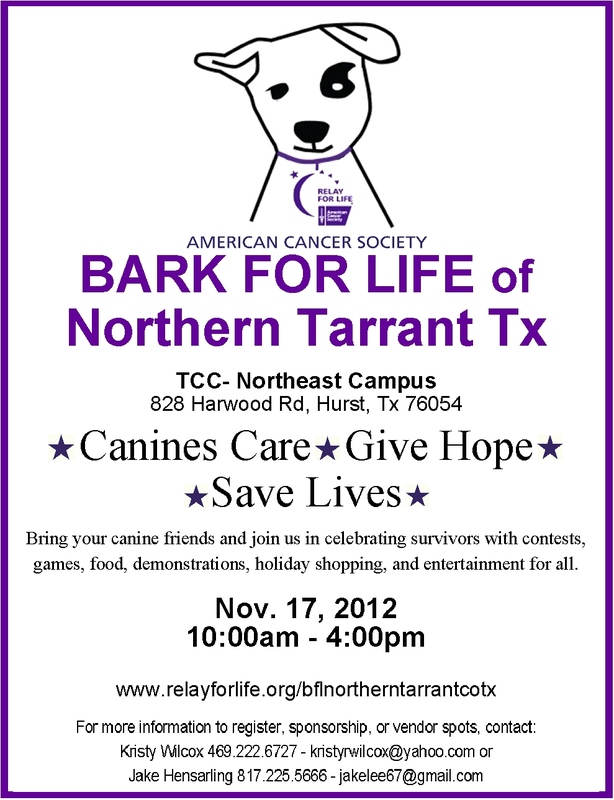 "Bark For Life of Northern Tarrant Tx is hosted by TCC-Northeast Campus. 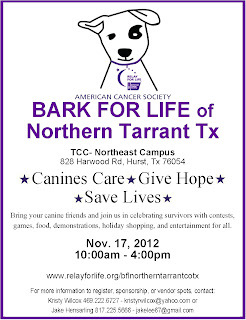 The first, annual Bark For Life is a fundraising event honoring the life-long contributions of our Canine Caregivers. It presents an opportunity for people to be empowered through their canine companion partnerships and to contribute to all cancer cures through the mission of the American Cancer Society. There will be a canine demonstrations, pet & owner contests, food, raffles/auctions, fabulous pre-holiday shopping, and exciting entertainment for all. Come help us celebrate life, remember loved ones, and fight back against the disease that takes too many." Dogs must be up to date on vaccines and remain on a leash. Please do not bring dogs known to have aggressive behavior to other people or dogs. Waivers must be signed. "Please join us for an amazing evening of Mix & Mingle as we bring the area's Small Business Owners & Professionals together for the latest installment of the MMSBNE monthly mixer. The Small Business Networking Events presents a Business Showcase. These are new and established businesses that will present ""What We Do"". If you've never been, Buttons has great food, great ambiance and live entertainment. Join us for an evening of networking, a great atmosphere and lots of fun. Booths are (2) tables and (2) chairs for $50. DFW Craft Shows Booth Special - through Thursday night your booth fee is only $30. Tell them you found their event on DFW Craft Shows.com! Mix_MingleBusiness@yahoo.com / 214-620-5708 / 972-442-1786. 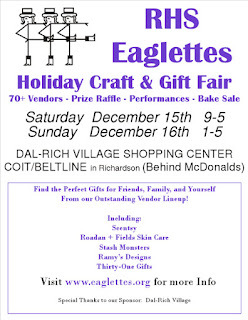 "Join us for our 12th annual Olde Town Christmas Craft Fair at Dottie Lynn Recreation Center. 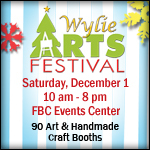 We have over 60 vendors, musical entertainment, a visit from Santa and much more!" Booths are 8 X 6 and cost $45. This fee includes two chairs and one free drink a day from the concession stand. Tables are available for an additional $10. Applications are available here along with their Rules & Regulations. Applications are due by November 27th, 2012. For more information, view their information here or contact their event coordinator at Whitney.chandler@arlingtontx.gov. "Please join us for the Silver Wings Gift Galleria! FREE ADMISSION! Over 100 Vendors! Fabulous Door Prizes!" Complementary refreshments will be available throughout the day, but lunch is an additional charge. Tables and electricity will be available for $10.00 each. For more information, visit their website or contact their event coordinator at silverwingsbc.giftgalleria@gmail.com. "1st Annual Holiday Craft Fair-- Come start your Christmas Shopping with some great local crafters and vendors. With a little something for everyone you are sure to get some great Gifts! Need your gifts wrapped? We’ll do it for you! All Proceeds go to the Saginaw Church of Christ Youth Mission’s Work. Have Your Picture Taken With Santa from 1 to 3! Gift Wrapping! Door Prizes! Bounce House! Face Painting!" These fees include 2 chairs.. Tables and Electricity are available for an additional $5 each. Applications are available here and are due by November 19th, 2012. For more information, visit their website or contact their event coordinator at branmom@gmail.com / 817-304-0681 / 972-804-2712. You may also email loretta4mk@yahoo.com. 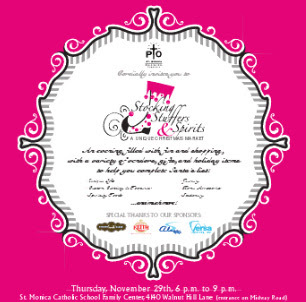 "Grab the girls and head over for an evening of shopping, light refreshments and prizes all for a great cause. Vendors will be selling items such as deserts, candles, make up, purses, totes, jewelry, handmade crafts and much, much more! There is no admission fee but toys and donations will be accepted for Angel Tree children." Booths are 8 X 8 and cost $45. This fee includes an 8ft table and two chairs. Electricity is limited and available on a first come first serve basis. Applications are available here and are due by November 25th, 2012. For more information, visit their website or contact their event coordinator at kteamer@hsdtexas.org / 972-998-9798. Booths are 9 X 16.5 and cost $20. Limit of two spaces per vendor. To apply, please email kathy@ladyjanesflowers.com. For more information, contact their event coordinator at kathy@ladyjanesflowers.com / 972-226-9000. You can also email mail@ladyjanesflowers.com. Admission Fee is $1 for students, $2 for adults, and children 5 and under are free. Admission is free! Booths are 10X10 and cost $25. Vendors are requested to donate something for the door prizes. Electricity is available. Applications are available here and are due by November 16th, 2012 (first come first serve). For more information, contact their event coordinator at celonej@lisd.net.